Free shipping. Buy direct from HP. 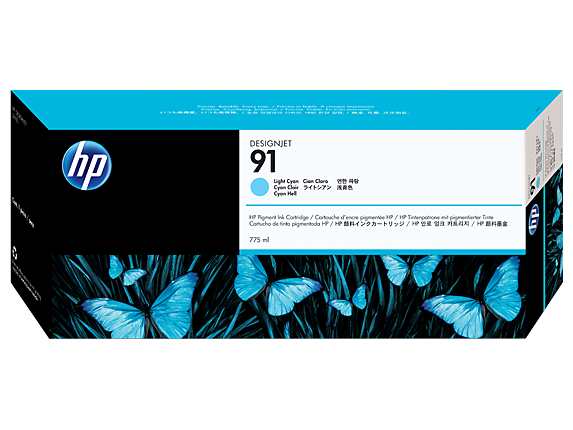 See customer reviews and comparisons for the HP 91 775-ml Light Cyan DesignJet Pigment Ink Cartridge. Upgrades and savings on select products. HP Photo Inks are designed for trouble-free printing with exclusive dispersion technology.Intelligence built into Original HP ink cartridges continuously optimizes quality and reliability.Avoid waste and rework—HP media and HP Photo Inks—designed to work better together.Original HP 3-ink Cartridges Multipacks offer significant savings and convenience.To ensure reliable, trouble-free printing, HP Photo Inks are rigorously tested. Intelligence built into Original HP ink cartridges provides alerts when supplies need to be replaced.775 ml ink cartridges enable high-quality, cost-effective printing with fewer interruptions.Original HP 3-ink Cartridges Multipacks offer significant savings and convenience.It's easy to identify and install the individual ink cartridge color you need to replace.Free, convenient return and recycling in 42 countries. Visit www.hp.com/recycle for details. Create high-impact prints with the wide color gamut and photo-image quality of HP Photo Inks.Interior in-window displays resist fading—over 1 year unlaminated, over 3 years laminated.HP Photo Inks produce true gray neutrality and rich black density.Interior displays, away from direct sunlight, resist fading over 200 years on a range of HP media.HP Photo Ink and Original HP media prints are water resistant and exceptionally fade resistant. Intelligence built into Original HP ink cartridges provides alerts when supplies need to be replaced.775 ml ink cartridges enable high-quality, cost-effective printing with fewer interruptions.Original HP 3-ink Cartridges Multipacks offer significant savings and convenience.It's easy to identify and install the individual ink cartridge color you need to replace.Free, convenient return and recycling in 42 countries. Visit www.hp.com/recycle for details. 1 Display permanence rating for interior displays/away from direct sunlight by HP Image Permanence Lab, and by Wilhelm Imaging Research, Inc. on a range of HP media. Water resistance and interior in-window display ratings by HP Image Permanence Lab on a range of HP media. For details visit http://www.globalbmg.com/hp/printpermanence. 2 Program features and availability may vary by country. For more information, visit http://www.hp.com/go/designjet/supplies. 3 Program availability and details vary. HP inkjet printing supplies return and recycling is currently available in 42 countries, territories and regions in Asia, Europe and North and South America through the HP Planet Partners program.